Heavy equipment can compact and damage soil structure, which can lead to lower yields. Ontario pork producer Jake Kraayenbrink has developed a new automatic air inflation/deflation (AAID) control system that can help solve the problem. hogfarmer.com). The system is marketed under his company name, Agribrink. The AAID system uses a programmable, in-cab monitor with high/low pressure settings that can be triggered at a flick of a switch. The air compressor has a quick-attach design so it can be used on different implements and can re-inflate tires at 36 cu. ft./min. The air tank is powder-coated and contains enough air to inflate tires at a safe road speed. It is equipped with a manual override in the event of an electrical failure. Farm tire specialists at Kraayenbrink’s Manure Demo Day on Aug. 21 in Moorefield, Ontario gave the inflation/deflation system two thumbs up. 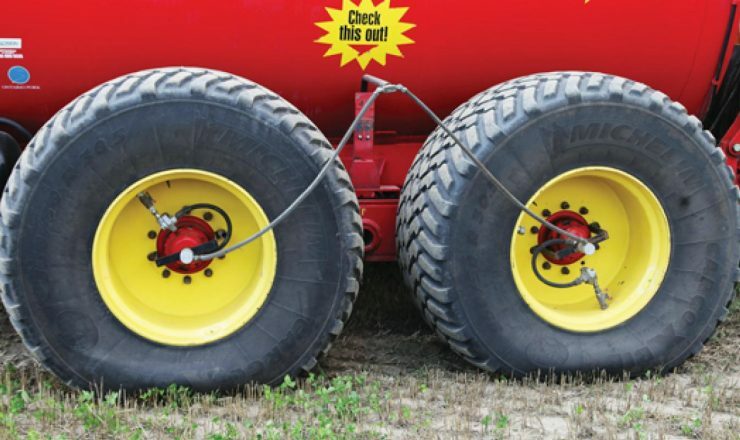 Without this type of equipment, farmers generally set a spring and a fall tire pressure. Now they can adapt tire pressure for different applications and field conditions, as needed. A tire’s footprint gets larger as the pressure is reduced for the same load, as shown in the adjoining photo. Over-inflated tires result in a shorter footprint, less traction and more spinning, which increases fuel use and compaction. No two radials are alike, nor do they perform the same. Those who look for sidewall rigidity usually tend to buy tires that are very thick and rigid. However, the attributes that restrict deflation also reduce the length of the footprint. All manufacturers are required by the North American Tire & Rim Association to publish technical data, including gross flat plate for each type of tire. But the numbers don’t always reflect the size of the footprint at a tire’s actual operating pressure for a given load and speed. Know your axle weights to determine the lowest allowable pressure and don’t hesitate to consult the manufacturer or an authorized dealer if you aren’t sure, Kraayenbrink advises. This will help you avoid rim slip, get maximum tire performance and ultimately help reduce soil compaction.